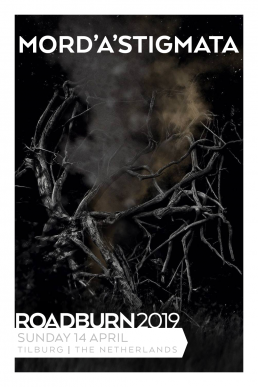 Poland has always been a fertile ground for quality black metal, and in the past few years, some of the country’s more wonderfully twisted sons have been taking the rich heritage of that scene and building upon it, reaching for those uncharted musical territories that we cherish so much here at Roadburn. Furia and Thaw were great examples of this bubbling creativity last year, and in 2019 it’s up to Mord’A’Stigmata to fire the opening Polish salvo. Like those two previous examples, this eerie quartet aren’t newcomers at all – established in 2004, they have been honing their craft and sculpting their individuality throughout the past decade and a half, culminating (so far!) in 2017‘s Hope, a striking and challenging album which explores the darkest corners of several genres throughout its four colossal songs. Black metal is always the leading dog in the searching pack, but the flexibility and nuanced approach the band has to their songwriting ensures that easy categorisation is never really at hand at any moment. The deepest-sounding doom and the ever-present shadow of Neurosis are as much felt throughout as any big name of the black arts, leaving the listener in an ill-lit, yet impassioned place once it’s done with him/her. Band from a country with a vibrant underground scene, taking an established genre and running with it to do their own exciting thing – Mord’A’Stigmata really have Roadburn written all over them, so we will proudly unleash them upon you.